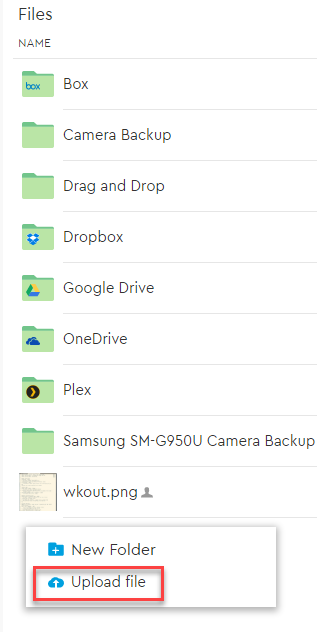 One central place to store and organize everything - My Cloud™ Home storage is home to all your content. With enough space to keep all your photos, videos and files in one place at home, you can organize it your way and access from anywhere with an internet connection. 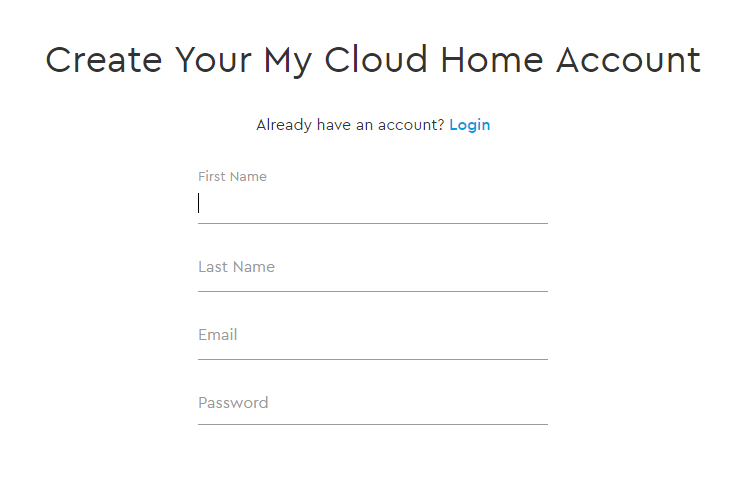 Quick and simple setup - Set up your My Cloud™ Home device quickly. Just plug it into your Wi-Fi router. 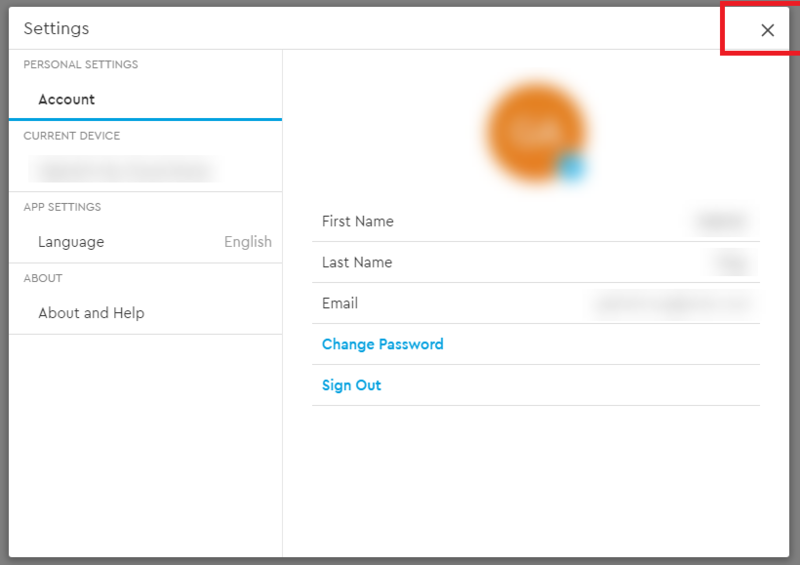 Then, use your mobile device to visit MyCloud.com/hello to set up your account, and start backing up, accessing and sharing. No computer necessary and no monthly fee required! 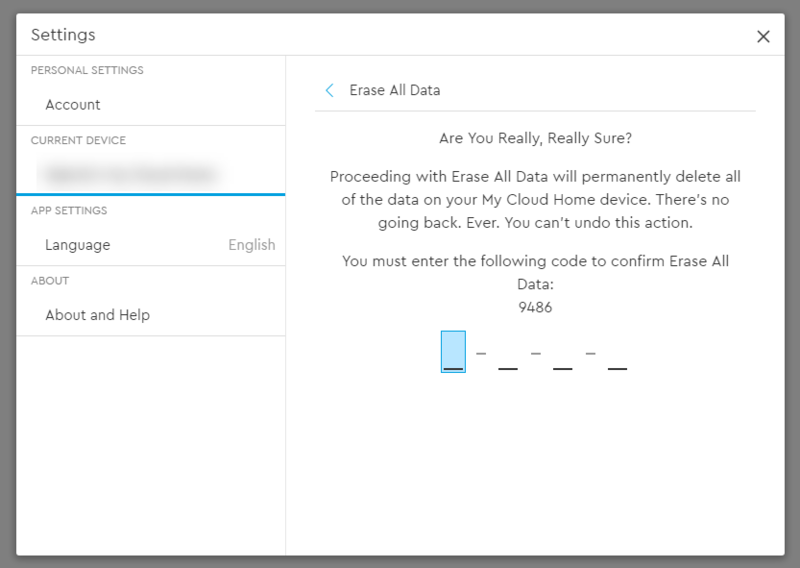 Everything saved twice with Mirror Mode - My Cloud™ Home Duo comes equipped with two hard drives and is set to Mirror Mode (RAID 1)*, so all your photos, videos and files are stored on one drive and automatically duplicated onto the second drive for extra peace of mind. 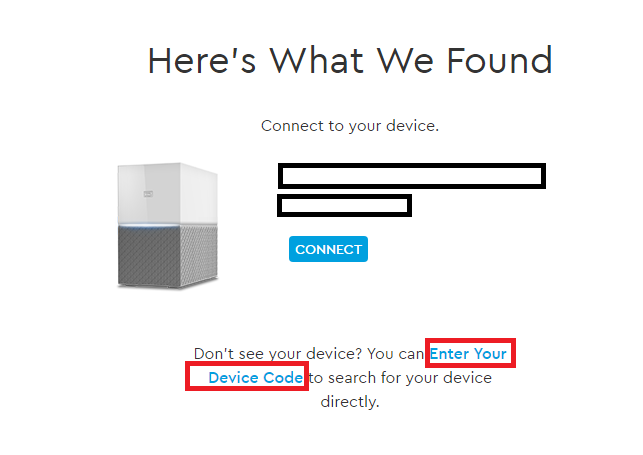 * This feature applies only to the My Cloud Home Duo, not the My Cloud Home single-drive device. Mobile, on-the-go access - Use the My Cloud™ Home mobile app, desktop app or MyCloud.com to upload, access and share your favorite memories and stream videos saved on your My Cloud™ Home device. 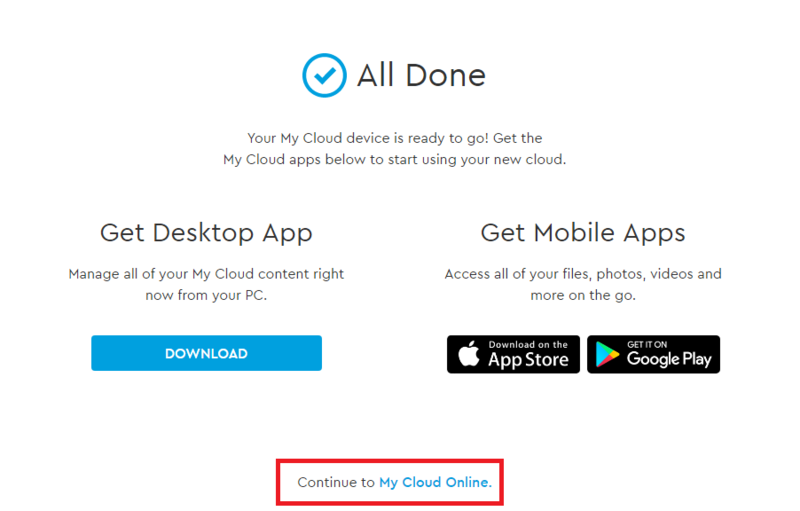 Auto backup for photos and videos on your phone - Automatically back up photos and videos on your phone to the My Cloud™ Home device so you can make room for more. USB port to import photos and videos from all your devices - Quickly import photos and videos from all the different devices scattered around your house, like USB flash drives and external hard drives, using the USB port on the back of the My Cloud™ Home. Keep all your favorite moments, action shots and adventures stored in one central, organized place. 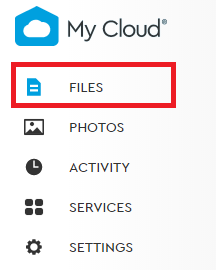 File search to find content easily - Quickly find photos, videos, movies and docs using easy-to-use search with the My Cloud™ Home mobile or desktop app, or on MyCloud.com. 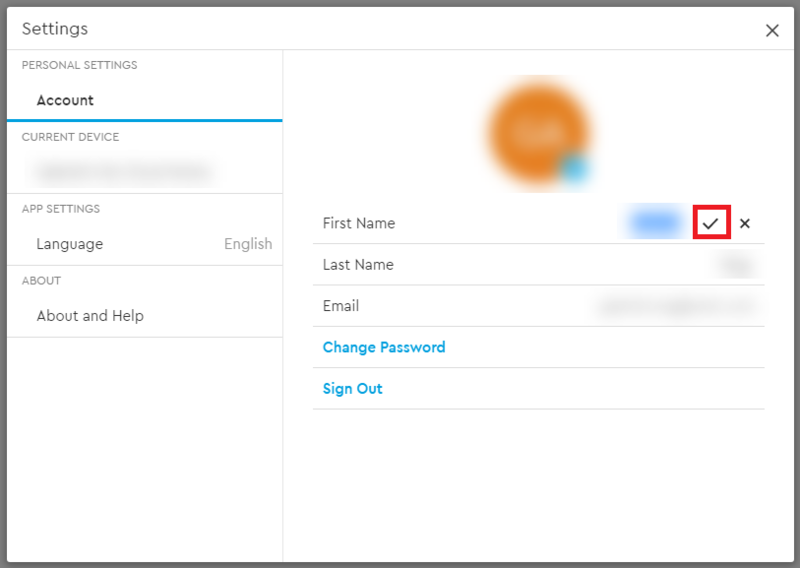 Individual, private spaces for each user - Invite family and friends to create individual accounts. Each invited person can set up their own private space that only they have access to on the device. They can manage, access and share their content as they want. 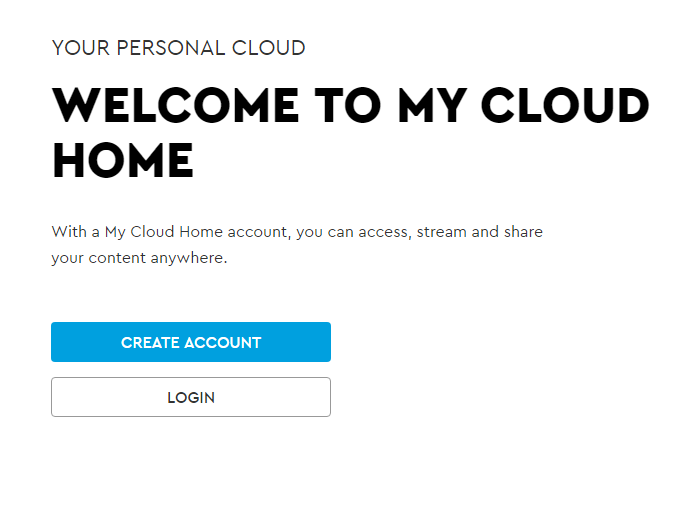 Third-party applications to customize your way - Tailor your My Cloud™ Home device to fit your personal needs and preferences using downloadable services, including Plex™ Media Server, Dropbox™, Google Drive and more. Cloud services may be modified and vary by country. 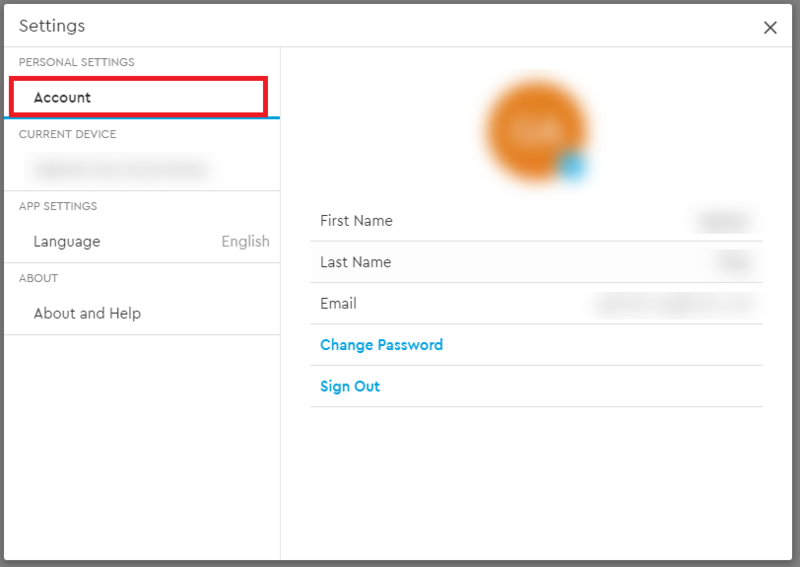 Cloud account download to keep everything in once place - Store everything in one place, even content in your favorite cloud accounts. 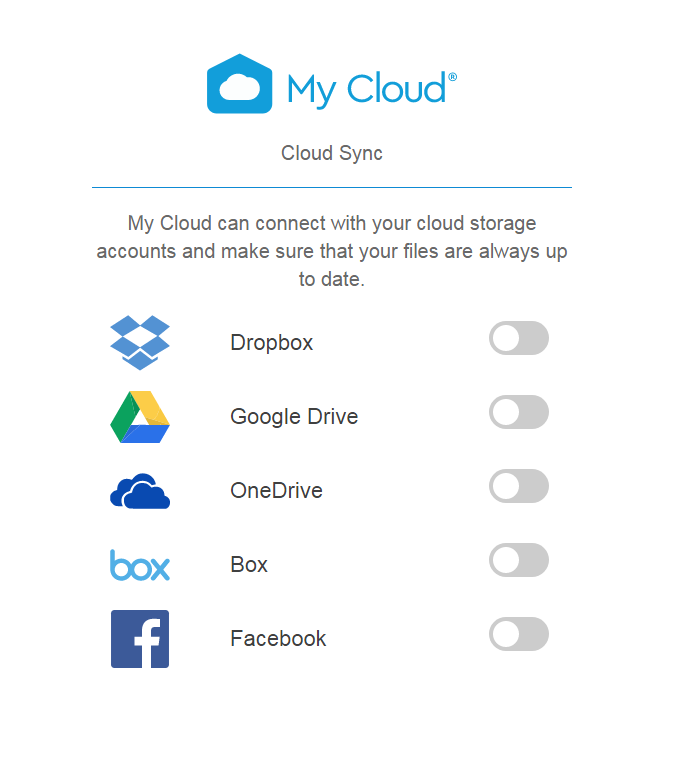 Photos, videos and files from your cloud accounts are automatically downloaded to your My Cloud™ Home device, including Dropbox™, Box, Google Drive, Facebook and many more. Auto backup for all PCs and Mac computers at home - The My Cloud™ Home device has enormous capacity and plugs into your network to wirelessly back up every computer at home to one central place. 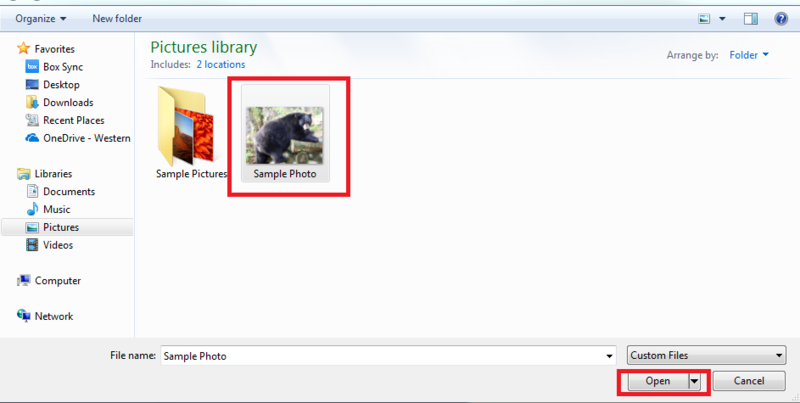 It works seamlessly with Windows® Backup and Time Machine software. Smooth video playback anywhere - Stream your personal videos anywhere, on any device, using the My Cloud™ Home mobile and desktop app or MyCloud.com. Quick and easy sharing - Collect all your favorite memories and moments in one place. 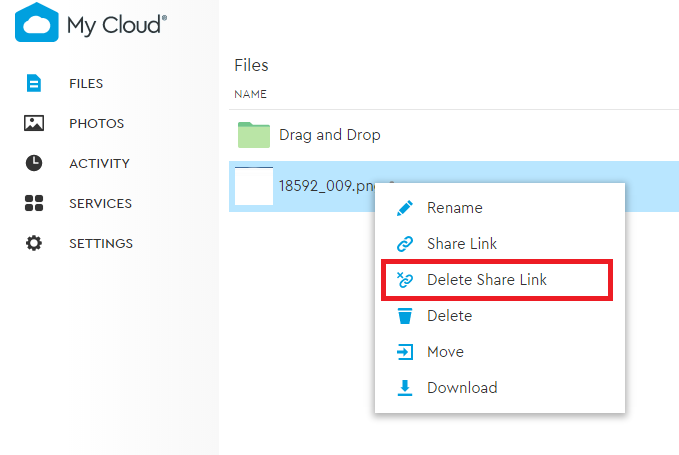 With just a few clicks, share photos, videos, documents or entire folders with friends and family, so nobody misses a thing. 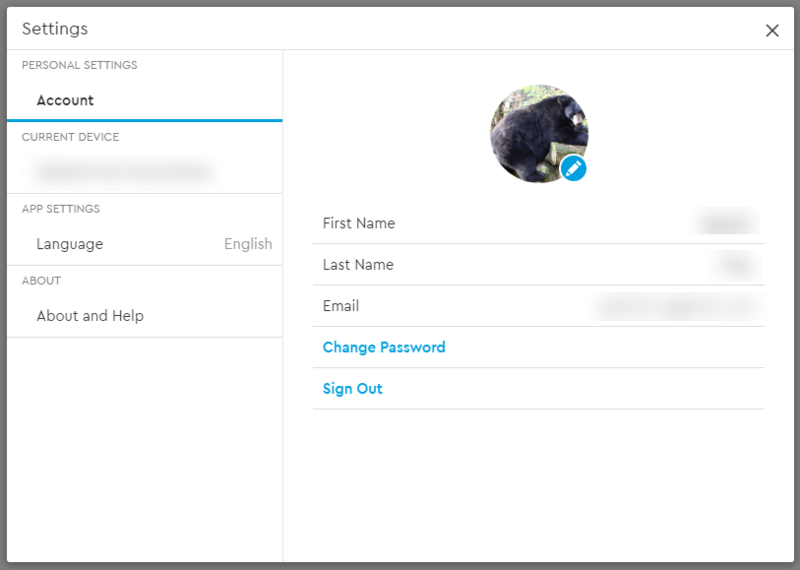 Your My Cloud Account is the MyCloud.com web app. Content accessibility is now available through the web app. 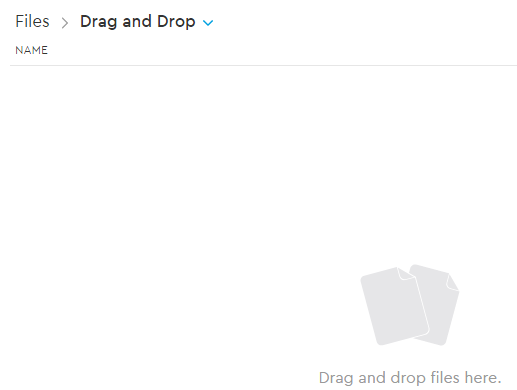 Folder Drag and Drop is supported using the web browsers listed below. 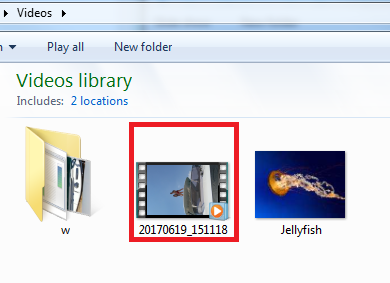 Clicking the upload icon by the top right window. 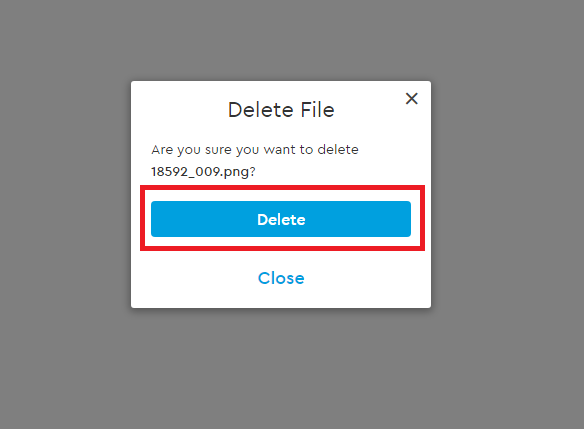 Right Clicking in the Files tab or any desired folder and Clicking Upload file. 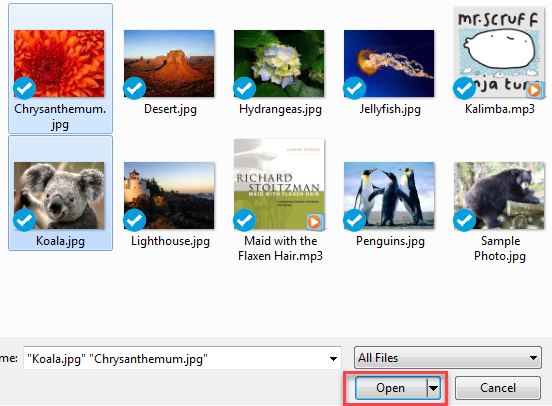 Through the pop-up window, find the file you want to upload. 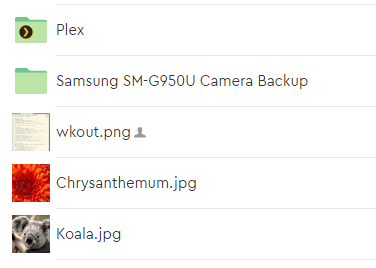 Select the file(s) you want to upload, then click Open. 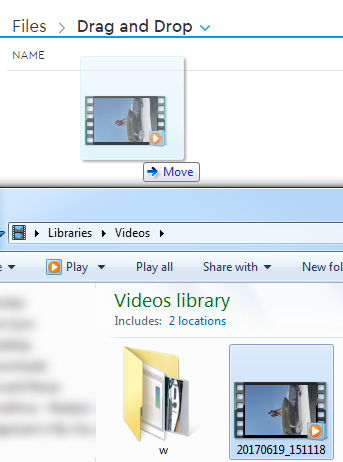 The upload will start and can be monitored from the bottom right window. 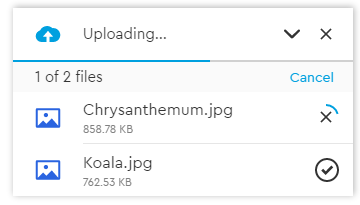 The upload monitor will read "Uploaded" once your files are uploaded and they should be visible in the folder you uploaded them to. MyCloud.com Web App: The content on your My Cloud Home device can be browsed or accessed through the Files and Photos menu options. Select the magnifying glass icon. 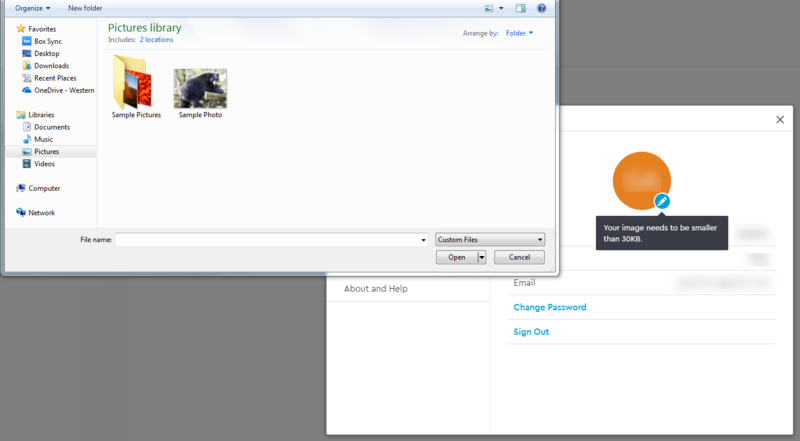 With the MyCloud.com web app, Select the Search field from the menu at the top of the browser window. 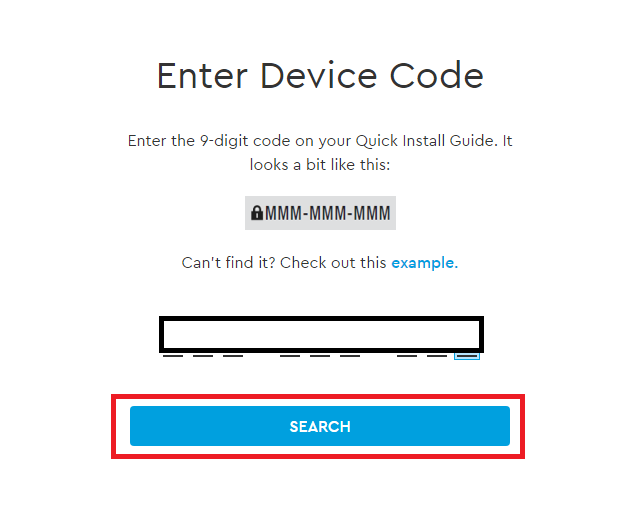 After typing in the search phrase, the My Cloud Home mobile app will automatically search; the MyCloud.com web app will require that you press the Enter key or select the magnifying glass icon to execute the search. 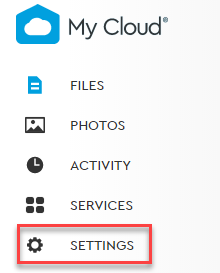 Through the MyCloud.com web app, Click on the Settings tab on the left. Click on your device name. 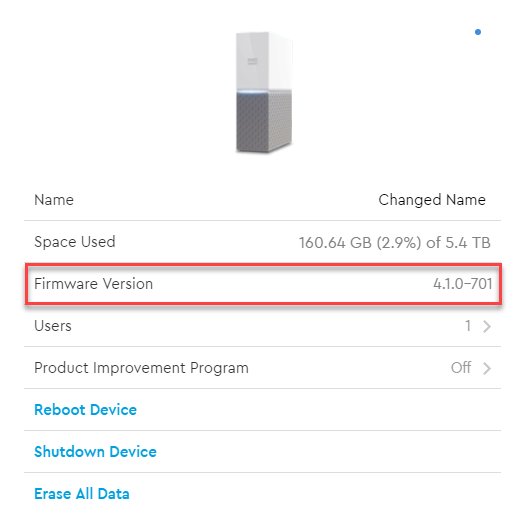 The firmware version of your device is listed under Firmware Version. 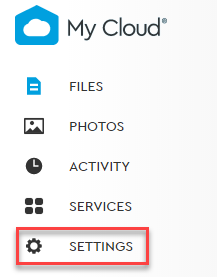 Through the MyCloud.com web app, navigate to the menu on the left side of the browser page and select the Settings option. This will open the Settings window. 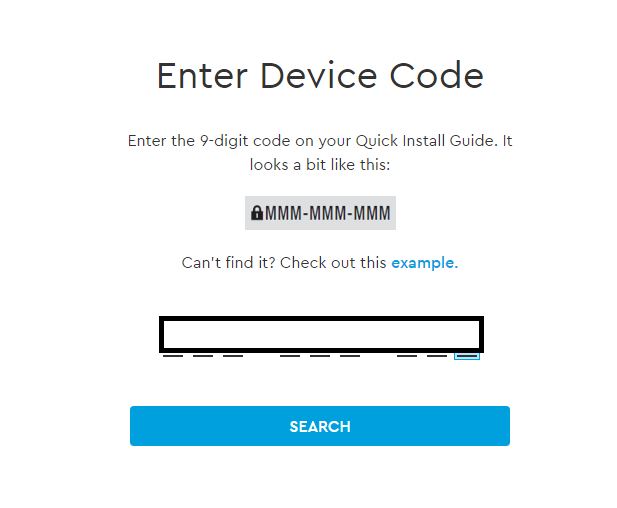 Click the CURRENT DEVICE section. 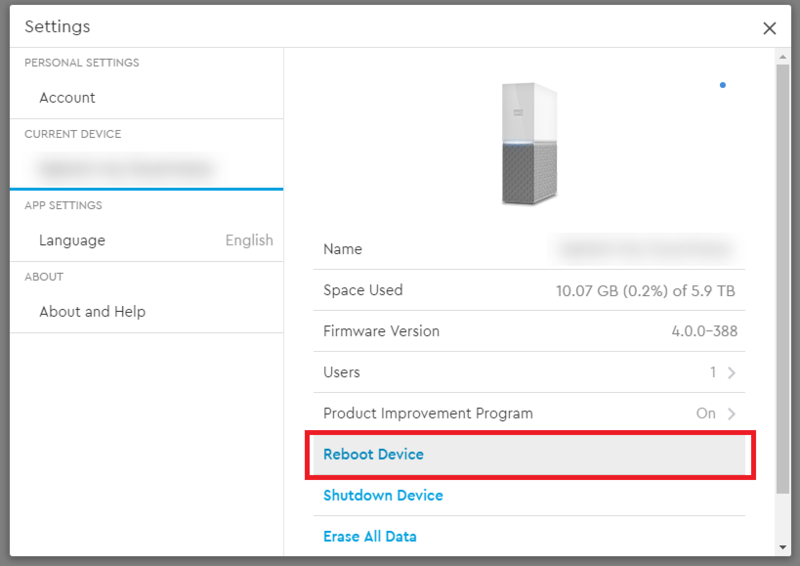 Select the Reboot Device option. 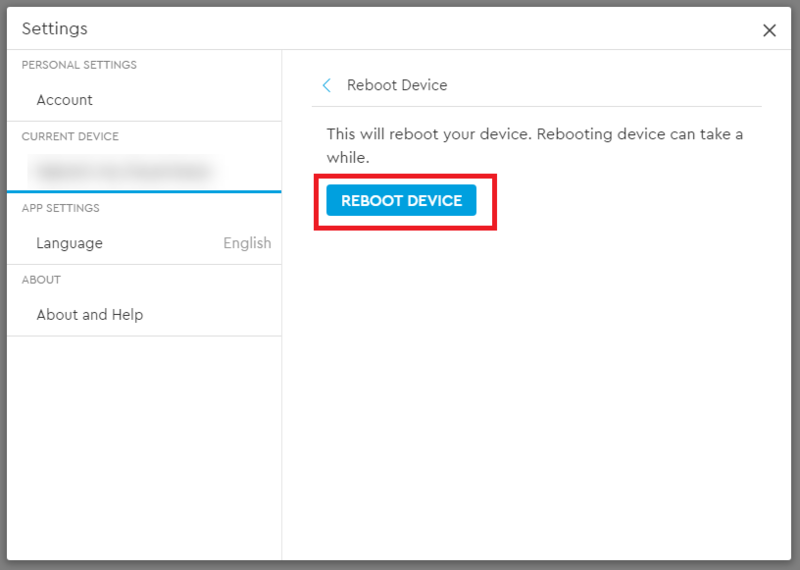 This will open the Reboot Device menu. 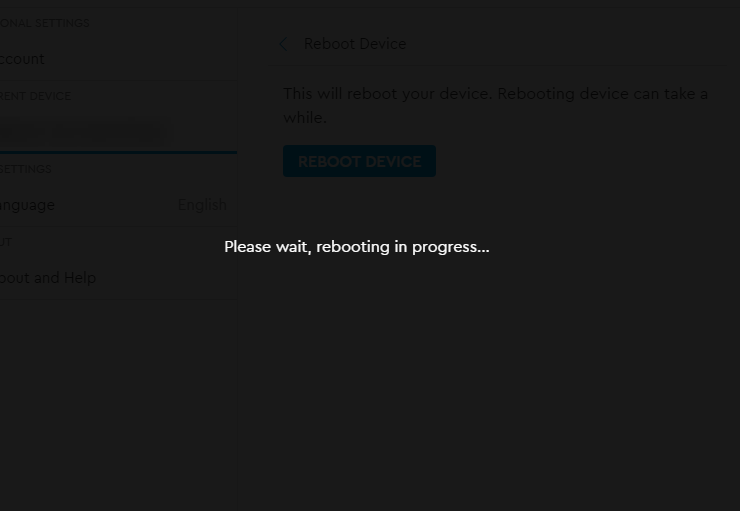 Select the Reboot Device button. The notification "Please wait, rebooting in progress..." will appear. This notification will disappear when the process has completed. 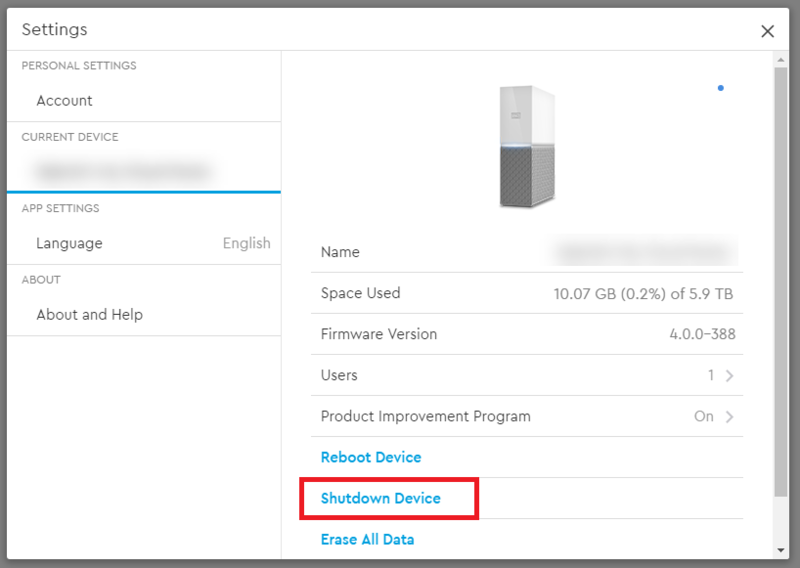 Select the Shutdown Device option. 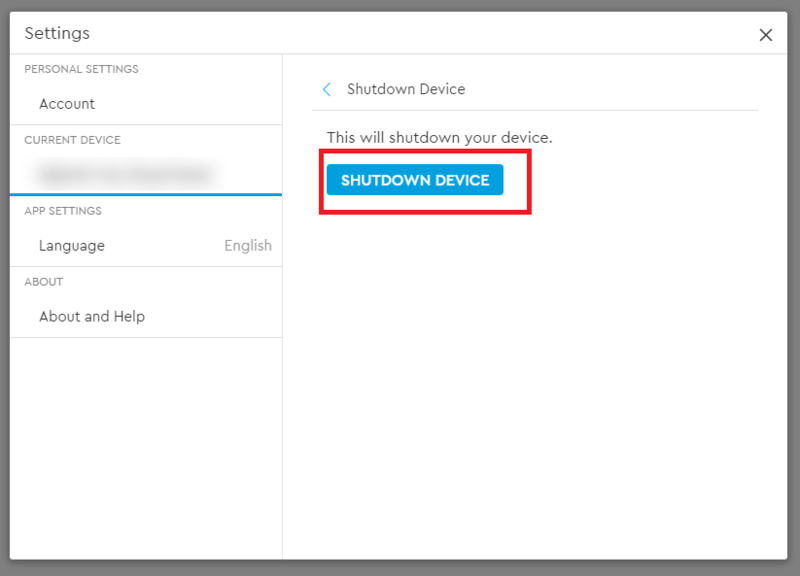 This will open the Shutdown Device menu. Select the Shutdown Device button. 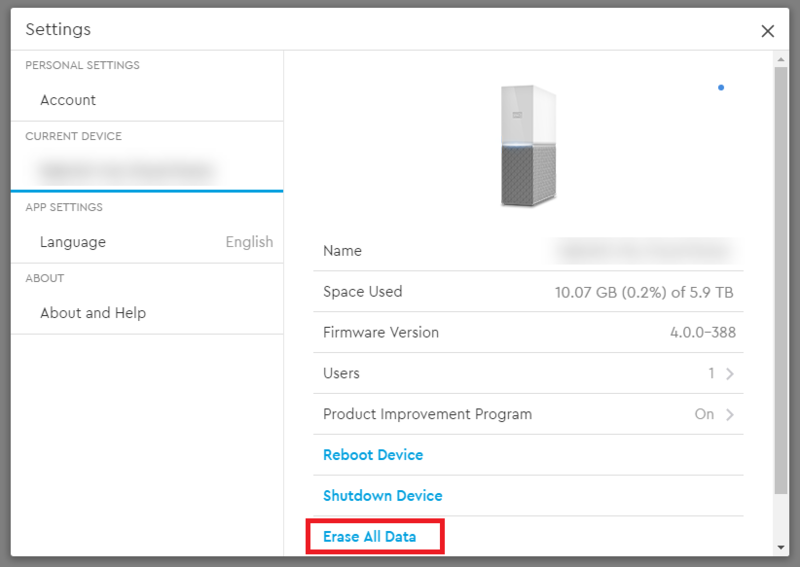 Select the Erase All Data option. 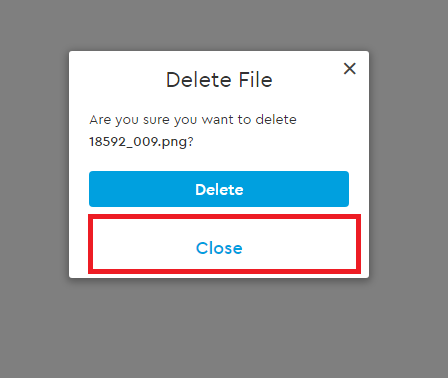 This will open the Erase All Data menu. 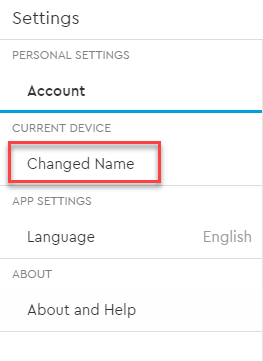 Under the PERSONAL SETTINGS section, the My Cloud account name is separated into two fields: First Name and Last Name. 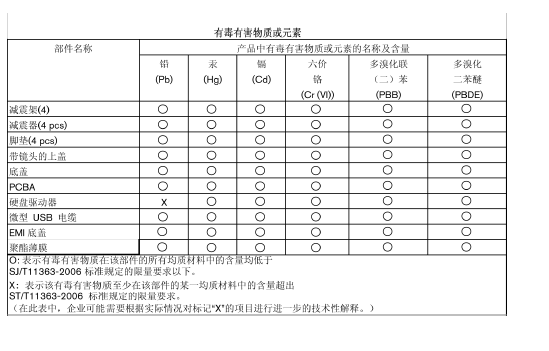 Select either the current First Name or Last Name. This will expand the field to include a check mark (✔) or an X.
Edit either name and then select the check mark (✔) to save or the X to cancel. 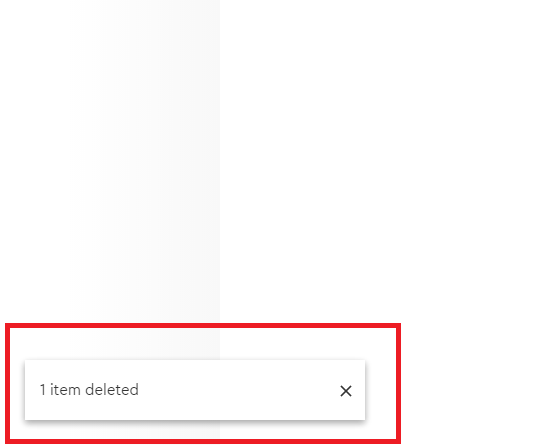 Select the X icon to close the Settings window. 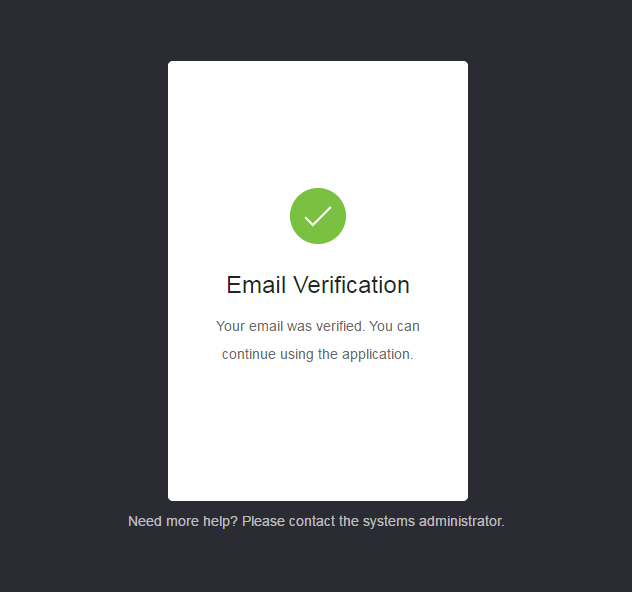 This process will affect the Profile Picture as seen through the My Cloud Home mobile app and MyCloud.com web app. If the Account tab is not already open, click on Account. 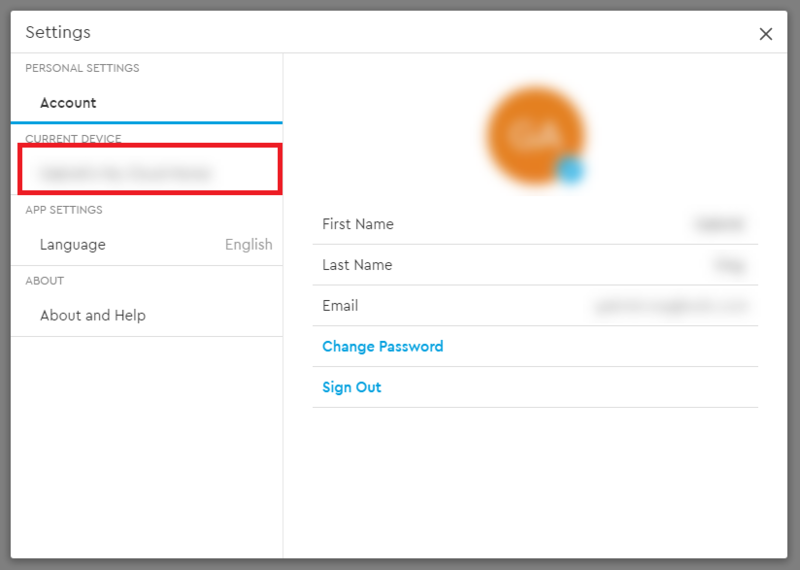 Under the PERSONAL SETTINGS section, your Profile Abbreviation or the Profile Picture currently being used will display. A Profile Abbreviation of the My Cloud account name is used by default until it is modified to an image. 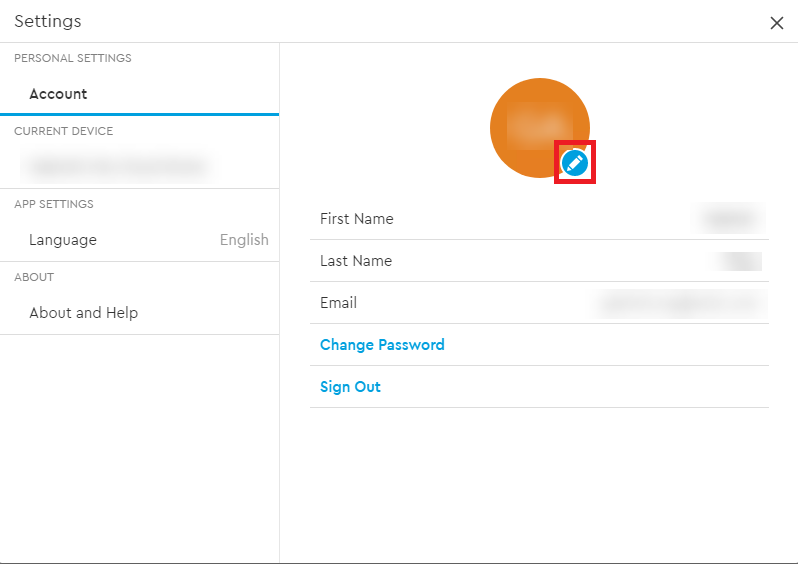 Select the pencil icon that overlaps the Profile Abbreviation or Profile Picture. A file explorer window from the operating system will open. Navigate to the image file that will be used as the new Profile Picture. Note: The image file must be less than 30KB in size. Select the image file and click Open. 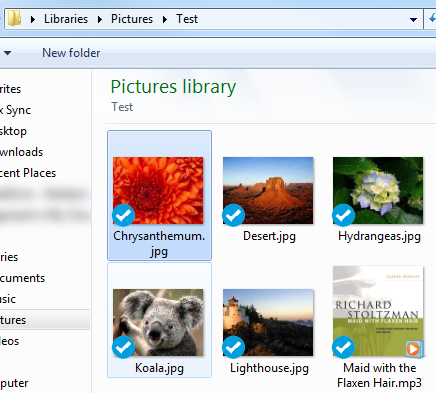 After making the selection, the file explorer window will close, and the new image will be visible as the Profile Picture within the MyCloud.com web app and the My Cloud Home mobile app. 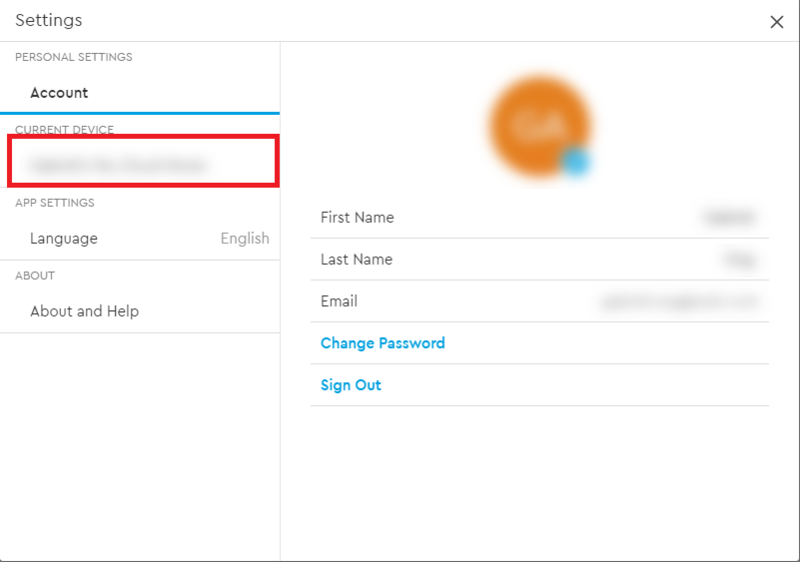 Under the PERSONAL SETTINGS section, My Cloud account information will display. Select the Change Password option. 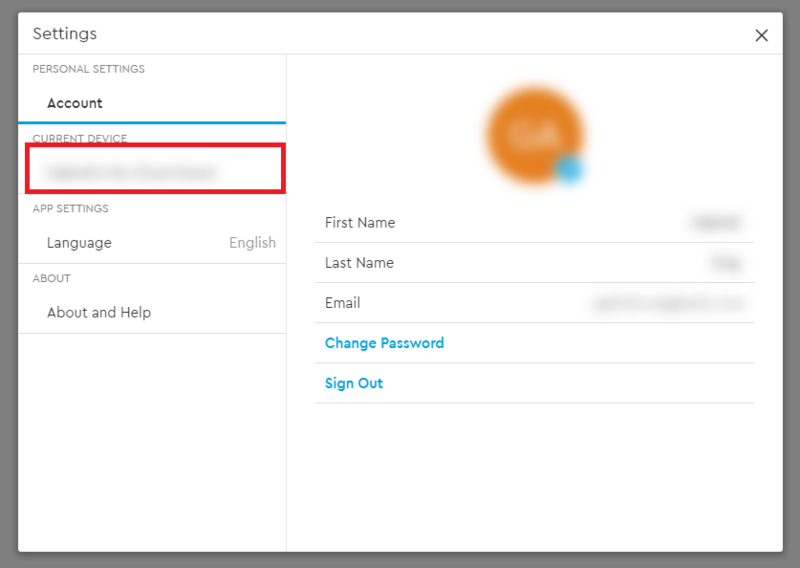 Under the Change Password section, enter the new password in the New field and Confirm field. 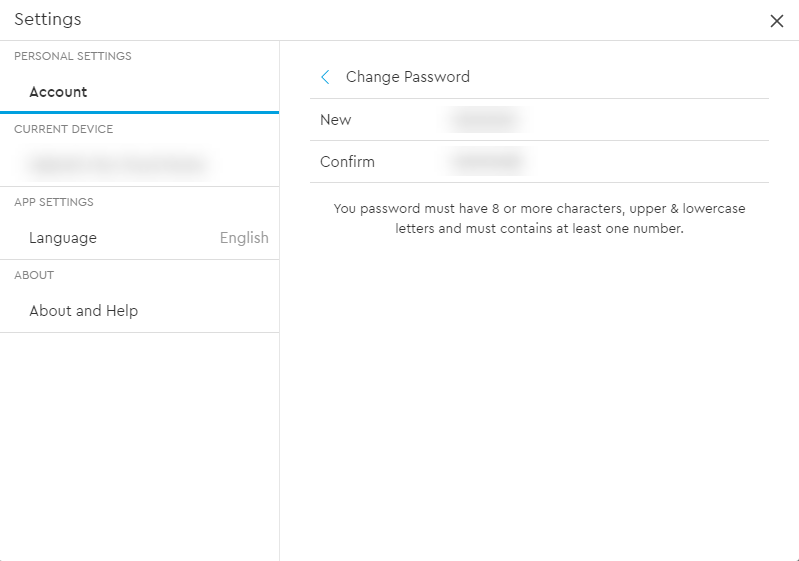 Then Select the Change Password button. 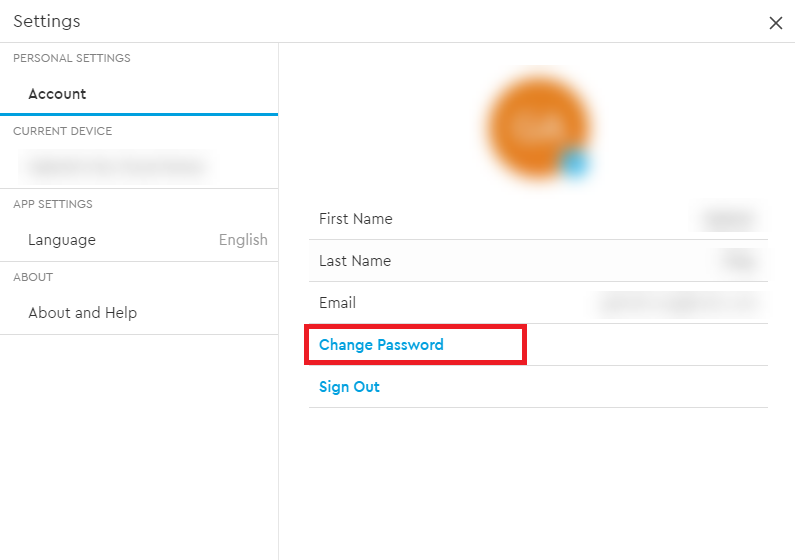 *Note: If the two passwords do not match, the Change Password button will not appear. 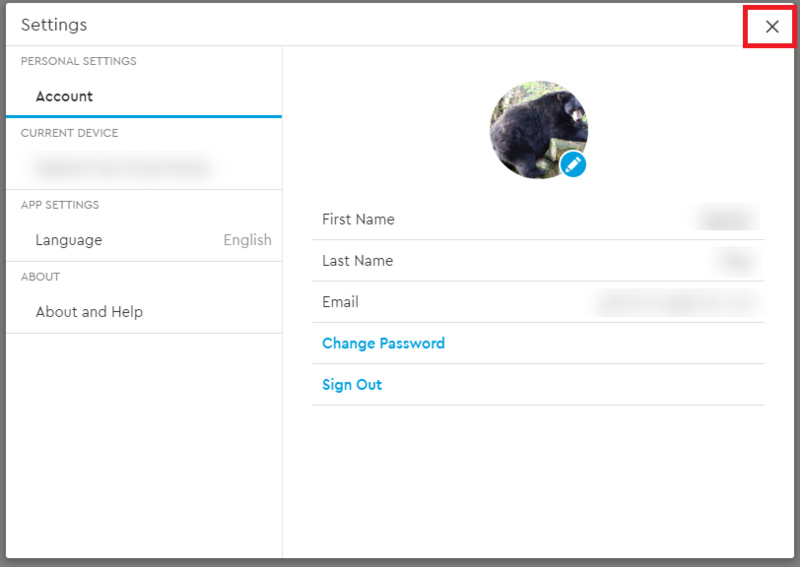 The My Cloud account password has been updated. 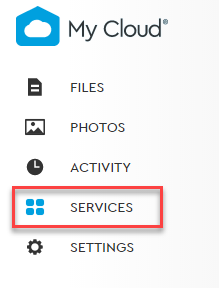 Through the MyCloud.com web app, navigate to the menu on the left side of the browser page and select the Services option. This will open the Services menu. 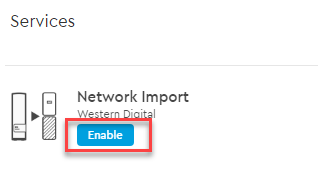 Select the ENABLE button next to the service you want to install. This will begin the installation process for this service. Follow the on-screen prompts to continue. Seamlessly synchronize files from your public cloud accounts, like Dropbox™ and Google Drive to your My Cloud Home device. This continuous, one-way sync helps you centralize your digital life and keep precious memories secure. 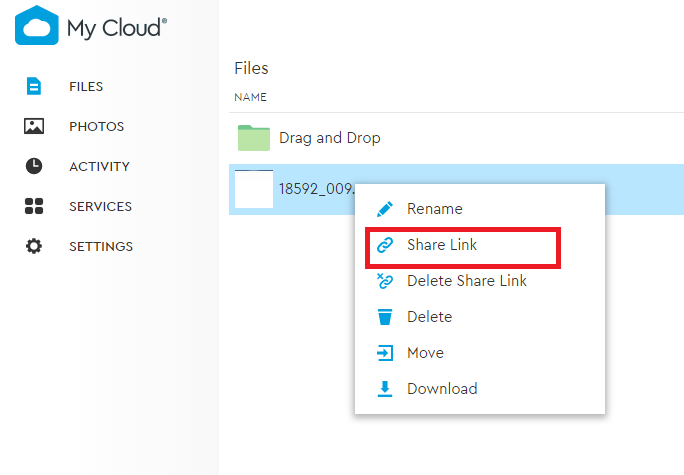 You can also save your Facebook uploads and albums to your My Cloud Home device. Access all your files from anywhere using your My Cloud Home mobile, web and desktop applications. 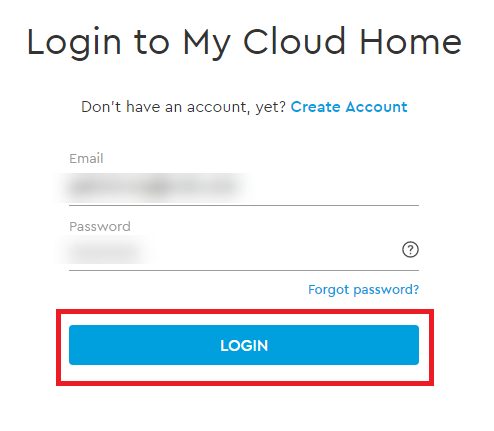 Sign in to your My Cloud account. On the left menu, Click the Services option. 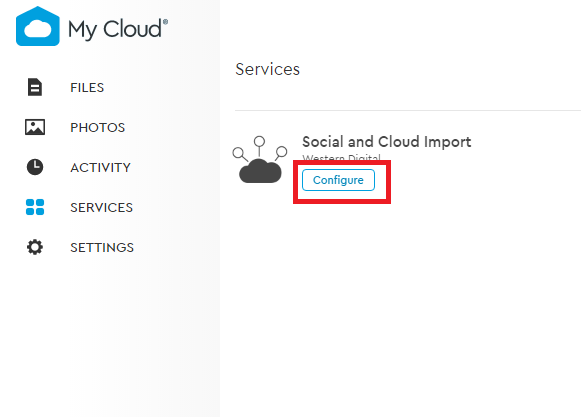 Click the Enable button on the Social and Cloud Import service. 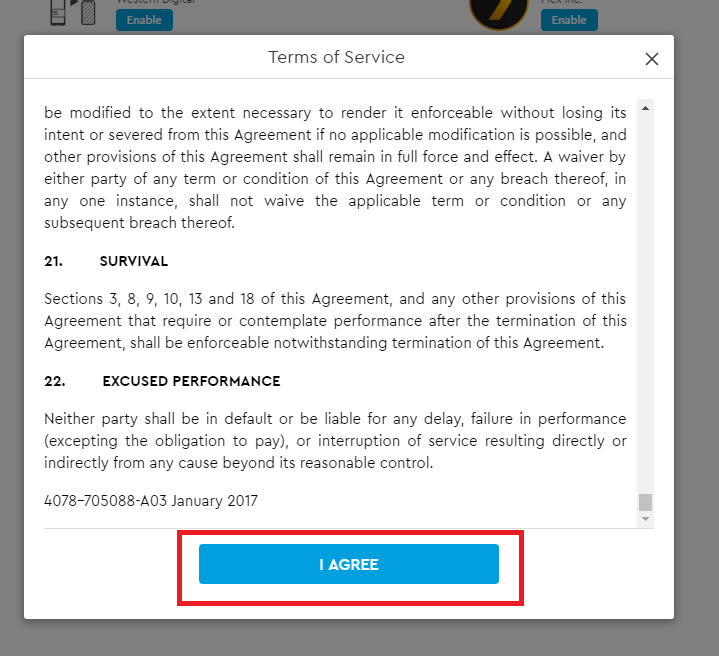 Read the Terms and Conditions and click "I Agree". 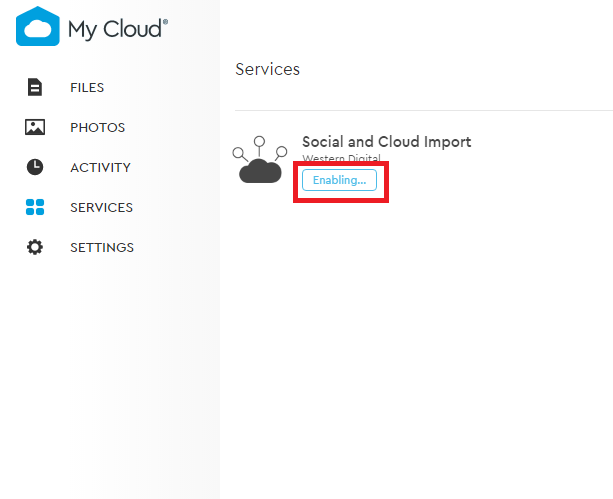 The Enable button will change to say Enabling..., wait until it changes again to say Configure. 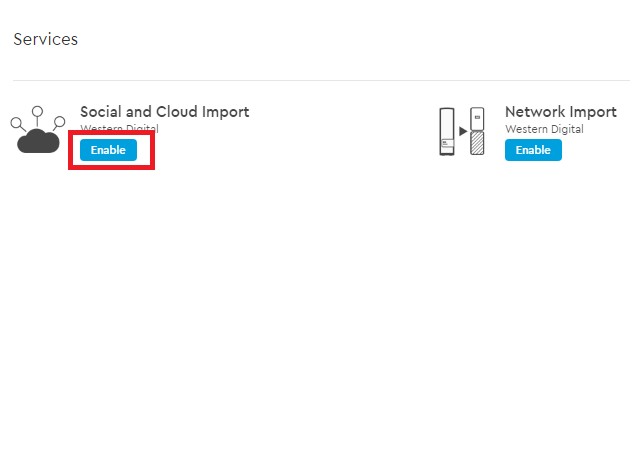 Click the Configure icon. 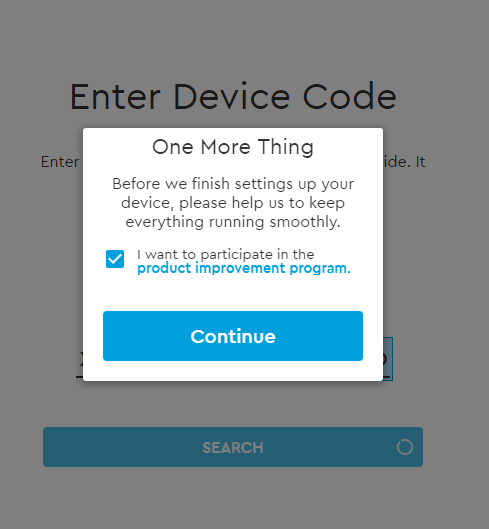 This will redirect to the Cloud Sync page. Click the slider button to the right of the corresponding service to synchronize. This will redirect you to the login page for the service you have chosen. 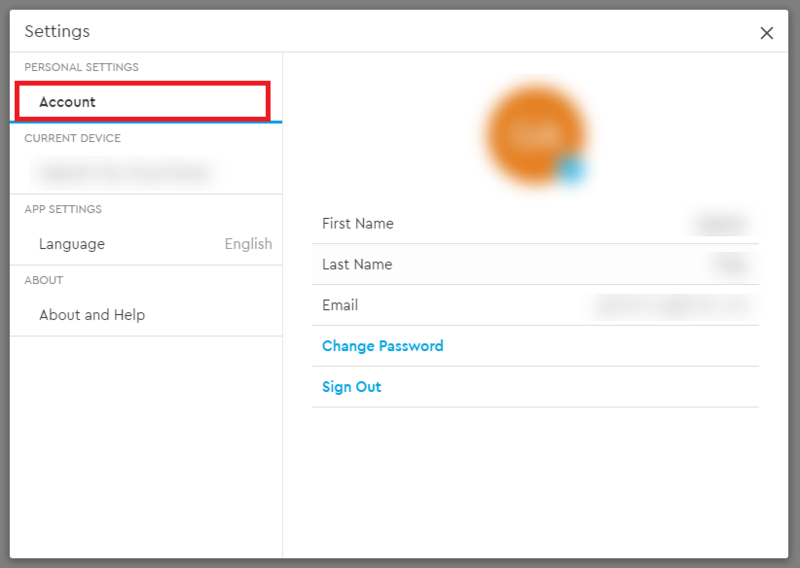 After you login to the service you have chosen Click Allow to continue. 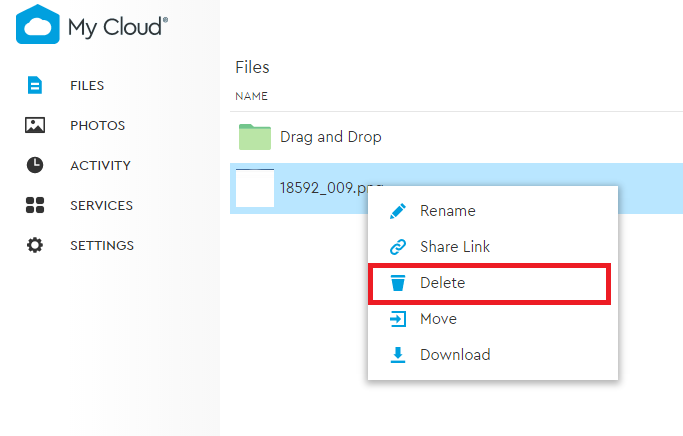 Once the sync has completed, under the Files section of your My Cloud account, a folder will appear with the name of the service selected, such as Dropbox, Google Drive or OneDrive. 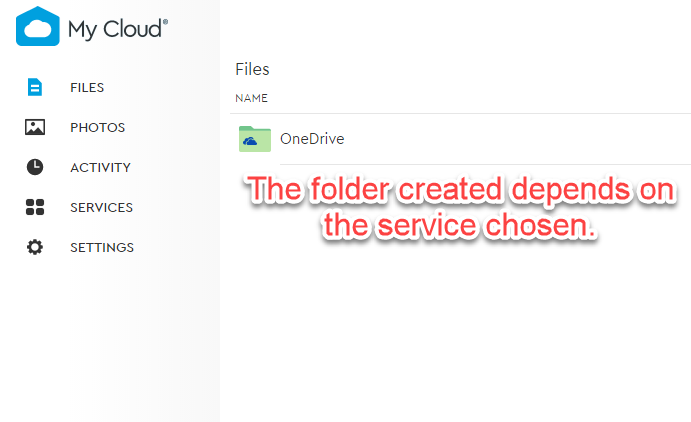 This folder will contain a copy of the files and folders from the selected service. Plex Media Server organizes all of your photos, videos, music, movies and TV shows, and gives you instant access to them anytime, anywhere. With the free Plex Media Server software on your My Cloud Home device, you can enjoy all of your personal media on all of your devices, and easily share them with friends and family. Want more? With our premium Plex Pass and Plex DVR, record over-the-air TV right to your My Cloud Home device to view on any Plex-enabled device. Set your media free! 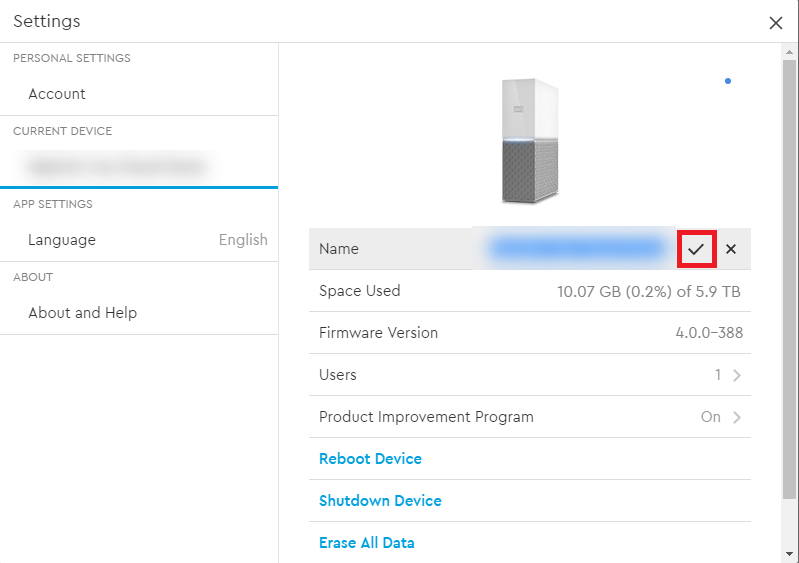 My Cloud Home does not support any special disk configurations. 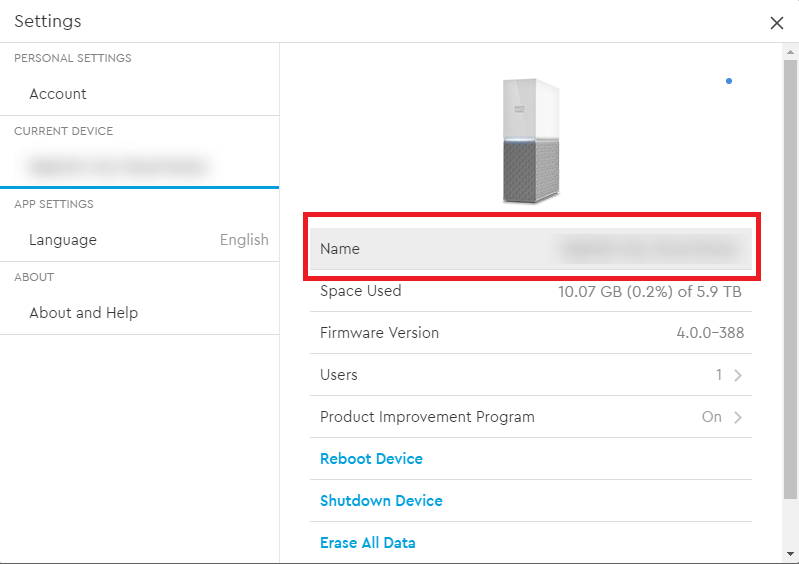 Disk Errors: If you receive an email from the My Cloud Team or your mobile device displays a message stating "Disk errors were detected on your disk" this means that one of the drives in your My Cloud Home Duo may need to be replaced. Use the following steps for the replacement process. The error message will indicate which drive is the problem, Disk1 or Disk2. 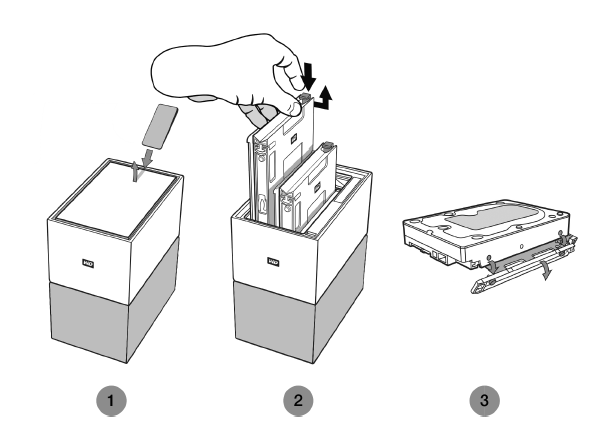 Use the following section RMA - Replacing a Drive to remove the drive in question. The drives are numbered. After removing the top lid, the enclosure has a number embossed into the ledge. 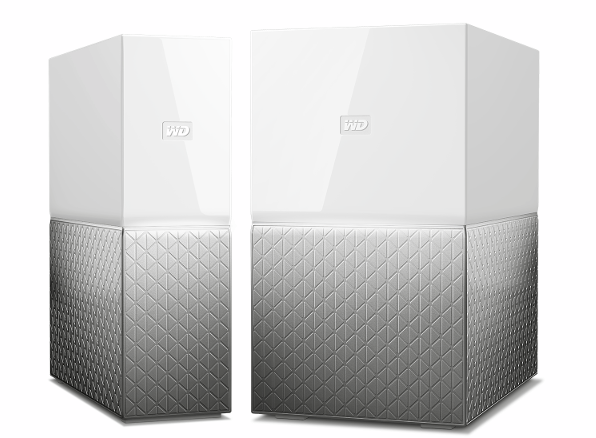 When looking at the unit from the front of the device, Disk 1 is on the left and Disk 2 is on the right. 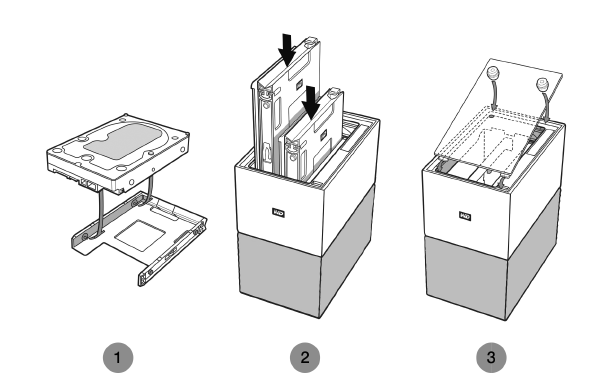 Use the instructions from Answer ID 8 noted in our FAQ for the RMA or replacement process.